Venus planters offer a reliable recycled plastic design alternative to clay or terra cotta planters. A variety of solids and bold, new granites make up a distinctive color palette. Venus planters are made from a durable lightweight all-weather recycled plastic polyethylene blend. Built to withstand the punishment, these recycled plastic planters will not crack or become brittle as with clay or terra cotta nor will they leach the salts or acids. 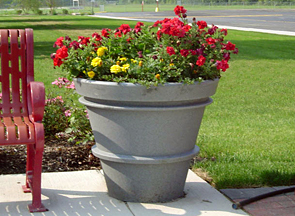 Consider the lasting value of these quality crafted recycled plastic planters. Matching Venus Saucers are available.